In this recipe, ‘millet’ refers to a millet grain in flour form – any kind of whole grain flour that’s fairly neutral in terms of taste. Buckwheat and rye, for example, will not do because of their dark colour and strong earthy flavours which may be at odds or even overpower the light fruitiness of the mangoes. Grains such as millet (bajra) sorghum (jowar), foxtail millet, amaranth (rajgira) and quinoa in flour form can be used to make this healthy dessert. I used sorghum flour, because it’s pale colour and mild taste allow other flavours to come through. Sorghum flour gives these fruity blondies a nice bite and texture. Their nutrition, and bite-sized sweetness are just what I need in a healthy snack for my 4pm sugar craving. With a hint of sugar, a lemony zing and the crunch of coconut, these orange-hued squares up the energy without the needless calories. Ripe, pulpy, juicy mangoes, grated fresh coconut and gentle, extra-virgin coconut oil moisten the the sorghum flour, transforming it from dry powder to freshly turned soil. If you use another millet flour, you may find the mixture slightly drier or wetter depending on the moisture-absorbing properties of that particular grain. All you have to do is add a tablespoon or so more of oil or mango pulp if it is dry or alternatively a tad more flour if you feel the batter is too runny. This is an extremely forgiving recipe and you’re hardly likely to go wrong. The recipe requires mango pulp so I roughly mashed them with a fork since I wanted tiny morsels of mango baked into the blondies. 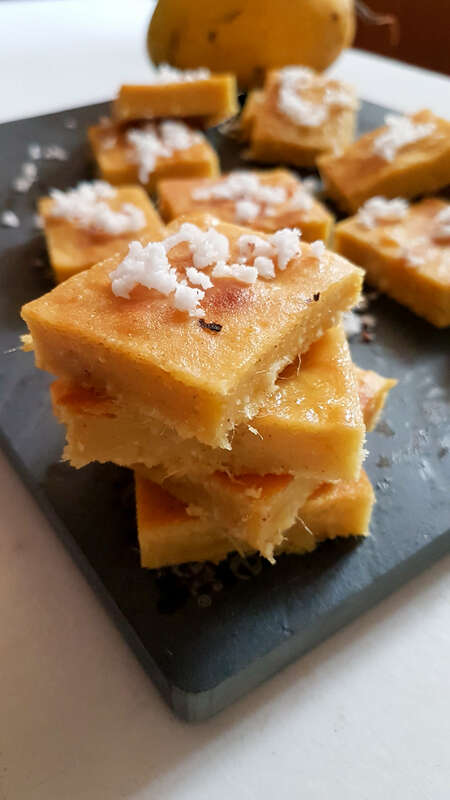 Small pillows of mango and crunchy curls of grated coconut create an interesting contrast in every bite of this healthy snack blondie. If you prefer a smoother texture, go ahead and puree the mango flesh and it’ll taste just as good. Once baked, allow them to cool completely and chill them in the fridge for a few hours before you cut them into pieces. It is better to store them in airtight box in the fridge because fresh coconut can go bad quickly at room temperature. Besides, I think they taste better, cold. Preheat your oven to 176℃. Line a 8” x 8” brownie tin with lightly greased baking parchment. Make sure to leave some parchment hanging out on either sides of the tin to help lift the blondies out easily. Whisk together the flour and salt in a bowl. In a larger bowl whisk the mango pulp with the coconut oil, lemon juice and sugar. Add the flour mixture and combine well so that there are no lumps. Now stir in the vanilla extract and grated fresh coconut. Pour into the prepared tin and bake for 30-40 minutes or till a toothpick inserted into the centre comes out clean. Cool the blondies in the tin and refrigerate for a few hours before cutting into 16 large or 25 smallpieces. They look so good! Wish I could get some quality mangoes over here. Thank you Angie. Try tinned mango pulp. Loved the idea, That looks so great and delicious at the same time. The recipe looks really exciting, as the use of mangoes for a dessert is mouthwatering. Keep posting such stuff.